heating element switched off, preventing any vibrations once hardened. Above the platform is a one meter thick sound-proof window that allows all RPC-626 staff to view and observe RPC-626. In case of containment breach, security shields will be lowered over the observation window. The cables holding RPC-626's cage platform are to be detached, and the bridge's explosive bolts are to be detonated. The heating element will be turned off and the platform will be plunged into the anti-vibration Bakelite. MSF are to be dispatched immediately to contain the entities and/or the subsequent malicious user, if any. The entire vertical shaft should be at least a kilometer below the surface of the Earth and any personnel that does not make the initial evacuation timing to the mass-elevator are considered entities of RPC-626 due to the nature of the object, and will be terminated by all MSF personnel as per RPC-626 Acquisition Protocol. 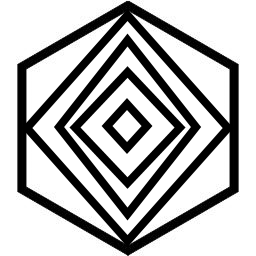 No more than thirty staff personnel are to be working on RPC-626 in the underground RPC-626 containment facility underneath Site ███ under any circumstances. All staff working on RPC-626 are to ignore any and all visual and auditory hallucinations, and any able to manipulate or interact with the environment is considered a containment breach. All staff are to be cycled constantly in a bi-monthly basis, to ensure good health and lessen the risk of death. Updated Containment Protocols: As of 12/03/20██, all personnel are issued closed shell helmets with optical sensors and cameras that allow continued work on RPC-626 with the ability to block out any hallucinations. A reminder that any hallucinations capable of manipulating or interacting with the environment is still considered a containment breach. Description: RPC-626 is a 2.1 meter tall pedal harp engraved in intricate design and unknown script that closely resembles Slavic and some elements of Asianic languages. While being approximately 46 kilograms (10 kilograms heavier than usual pedal harps) and with an ancient appearance, RPC-626 is unlike any conventional pedal harp used in the past or in the modern era. RPC-626 is made of two components, a base dock and the actual harp itself. A separate lever engages and disengages a locking mechanism that locks the harp into the dock which houses the pedal system that allows chromaticism of the notes being played. RPC-626 is made of an unknown golden metallic alloy, with the only identifiable material in the detachable harp being a very tensile catgut coated with a unidentifiable substance that gives the strings a glimmering red tinge when observed. 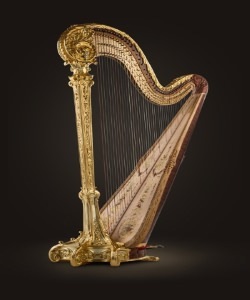 The detachable nature of RPC-626 as well as handles throughout the frame suggests that the harp was once intended to be used man-portable and on the fly. The dock also integrates a sitting stool padded with leather and within, feathers from an unknown avian species. RPC-626 exhibits also exhibits a slight radioactive emission at approximately 10 to 30 µSv. An X-ray analysis of RPC-626's base dock shows that the pedals do not have mechanical mechanisms, but instead have a strange etched wood-like circuitry within that connects the string nodes to the pedals. All nearby living beings in a 100 meter radius falling into an near-instantaneous comatose state. A rapid shaking of the environment that is akin to an earthquake rated 7.0-7.5 on the Richter Scale. Any subject out of the 100 meter radius is not affected, and does not sense any shaking. The complete liquefaction of all living beings in a 100 meter radius. A string that extends the range of any effects, extended about 10 meters whenever strummed. The [REDACTED] of cadavers, creating [REDACTED] that exhibit violent behavior, controlled by a series of melodies, and movements as complex as the tunes themselves. The creation and dissonance of several weather elements, such as thunderstorms, typhoons, lightning, hail, wind, and snow. This also includes unconventional weather, such as a sudden absence of oxygen, the reversal of gravity itself, and the raining of extremely unextinguishable miasmic flame. The immediate stitching and fusion of any and all wounds in the area. Users are usually not affected by these effects. Users who use RPC-626 also report a general increasing feeling of weakness as they continue operation of the object. Children and those with terminal diseases are thus not the proper users for RPC-626, and can killed as indicated by Experiment RPC-626//[REDACTED]. The best users for RPC-626 are those of at least adult age and in excellent health and exercise. RPC-626-2: Humanoids clad in unknown armor that resemble elements of European medieval and ancient Japanese layered plate armor. These humanoids are usually unable to communicate due to the language barrier, and are almost always accompanied by strange weapons anywhere between swords, falchions, bows and arrows, and curved glaives. It can be inferred that the language spoken here is the same as the written component that is etched onto RPC-626. RPC-626-3: Humanoids clad in highly technological armor, baring several barcodes and insignia from unknown units of a professional military. Occasionally, some limbs may be entirely cybernetic, and are capable of advanced manipulation and weapons systems currently impossible to recreate through observation and current Authority technological means. Individuals from this type of hallucination are almost always equipped with some sort of exoskeleton, and accompanied by advanced ballistic trajectory weapons powered by unknown means, having a similar appearance to a scaled-down version of a high-powered railgun. Weapons that fall apart or disengaged are seen with cylindrical magazines full of an viscous black substance that seems to be the ammunition of said weapons. Unlike the first type of hallucination, these individuals are able to converse in a language similar to a cross of German and English. As such, these hallucinations can be spoken to. On August ██, 2005, RPC-626 was found when Authority researchers were made aware of an deorbiting unidentified object making a re-entry into the atmosphere. Projected impact was somewhere near the coast of the eastern United States. Short-range imaging made apparent of the object - a golden harp. Vegetation made recovery difficult, and seemed to interfere with the strings, which pulled one of its strings, causing a category 5 major hurricane. The resulting hurricane caused almost $125 billion USD in damages, wind speeds of 280 km/h and 1,833 fatalities in the storm and ensuing chaos. After the cleanup, RPC-626 untouched in the exact geographical location. Amnesiacs were administered, and the Authority finally completed its absorption of the Federal Emergency Management Agency. Should RPC-626 breach containment in any way, all RPC-626 containment breach alarm switches are located in every hallway, and no more than 46 meters from each interval. The cables holding RPC-626's cage will be unlatched, and the bridge's explosive bolts will be detonated, plunging RPC-626 into the bakelite. This is to prevent any unauthorized usage of RPC-626, or RPC-626-1 from acquiring the harp. MST Charlie-626 will be dispatched immediately, and all non-essential personnel are to evacuate to the mass-elevator in approximately 5 minutes. MST Charlie-626/1 operators will contain 626 and suppress 626-1 if applicable. Conventional firearms do not seem to be very effective to RPC-626-1, as the subject is capable of being faster than typical calibers. High speed cameras report RPC-626-1 capable of reaching speeds up to mach 3, three times the speed of sound, thus making a 5.56x25mm round clocking 3,260 FPS, just under mach 3 an absolutely useless attempt, let alone the 9x19mm parabellum rounds (1,180 FPS) typically issued to non-combat personnel. MST Charlie-626/1 operatives will suppress 626-1 using a surrounding formation, while MST Charlie-626 operates RPC-626 to eliminate 626-1. MST Charlie-626 "HEAVEN'S FIST" operators are now equipped with a experimental prototype ballistic firearm using caseless ammunition capable of mach 5 velocity. It is discovered that 626-1 is capable of taking entire magazines to armor before penetrating through and doing damage, despite having the appearance of steel plate armor. MST Charlie-626/1 and MST Charlie-626/2 operators are now advised to engage 626-1 while a third strike team, MST Charlie-626/3 acquires and interacts with RPC-626. The only way to dispel RPC-626-1 is a rapid note progression of the █ note, the ██ note and █ to produce a simple hymn reminiscent of a folk-tune. Should RPC-626-1 be further than RPC-626's effective range, the plucking of the ██ chord should be used to extend its range. During a containment breach above RPC-626's facility on Site ███, RPC-626 seemed to being to resonate a low tone, before emitting a high powered EMP shockwave, frying all non-shielded electronics. Visual confirmation was made of RPC-626 illuminating before forming a humanoid known now as RPC-626-1. Containment breach confirmed, and explosive bolts were detonated. RPC-626 was confirmed to be in the bakelite, however the vertical shaft's blast door was quickly breached, both autocannons were disabled. Both MST Charlie-626/1|2 teams arrive via mass-elevator, with a affirmation of 17 RPC-626 staff confirmed evacuated. MST Charlie-626/1 and 2 split as per Acquisition Protocol. MST 626/1 operatives execute several instances of RPC-626. After confirming the dead, MST Charlie-626/1 encounters the entity known as RPC-626-2, the following is an excerpt of surveillance footage captured of the incident. MST Charlie-626 Operators arrive at Corridor 626//005-A Wing. A voice is heard pleading ahead, and the operatives move forward to investigate. Curving at the L intersection of Corridor 626//005-A Wing, visual confirmation is made of Authority Senior Researcher Dr. ██████, who is lying on the floor with his arms raised in an attempt to shield the attack, next to Authority Researcher Dr. ████████ who is decapitated from the waist down, visible entrails. RPC-626-2 visible wielding an elongated glaive, coated in blood spatter. Dr. ██████: (in Italian) Cazzo! (in English) Do not get near me, puttana! If you are to kill me, make it fast! Dr. ██████: Do it! DO IT! It was at this point RPC-626-2 impaled Senior Researcher Dr. ██████ with the glaive, who bled from his chest wounds fatally. RPC-626-2 twisted the handle of the glaive, and Dr.██████ as well as nearby corpses began to decompose in a rapidly efficient amount of time, with light energy visibly being absorbed by RPC-626-2. MST Charlie-626/1 responded by opening fire. MST Charlie-626/1 suffered heavy casualties, losing almost all but three operatives. Speed of RPC-626-2 was seen to be increased, and much more physically strong. Subject is designated RPC-626-3. He appears to be a Caucasian male of 6'2" height, and lacks a left arm. This wound causes him pain, but is not bleeding, despite the wound looking fresh and bone being visible. He is dressed in black technological armor, and wears a closed-shell helmet with a huge hole, exposing an augmented green eye. He is covered in what appears to be blood. Artist reconstruction of RPC-626-3's insignia. Foreword: After realizing that the second type of hallucination could speak a language similar to German and English, Dr. ███████, born in Germany and fluent in both German and English, experienced  and quickly attempted to interview him before he dissipated. The following is the result. At this point, RPC-626-3 began to disappear. Under no circumstances is RPC-626 to be tested without Site Director approval. Only those with Level-4 Clearance are allowed to view the list of melodic progressions and their consequential effects.